Owing to our vast industrial experience in this domain, we are instrumental in providing Cone Winding Machine to our valuable customers. This Cone Winding Machine is acknowledged amongst our clients due to its excellent performance and long service life. These products are used in winding silk, cotton and nylon. We manufacture an exclusive range of Thread Winding Machine that is fabricated using high quality raw material and can be customized to suit the specifications provided by our clients. Moreover, Thread Winding Machine can be availed from us at the most competitive prices. - Precise split of sewing threads to small lots. - Automatic measurement of thread-winding. - Soft sound & long life span. 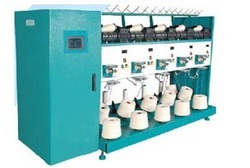 Our customers can avail from us a broad assortment of Thread Winding Machines for Textile Industry. This range of Thread Winding Machines is highly appreciated for their robust construction and excellent workability. These Thread Winding Machines can be availed in various sizes, grades and capacities. Our customers can avail from us an exclusive assortment of Thread Winding Machine which is highly efficient to perform the task by using its strength. This Thread Winding Machine are used heavily in textile manufacturing, especially in preparation to weaving where the yarn is wound onto a bobbin and then used in a shuttle.